Bangalore: Valuepoint Systems, one of the leading complete IT infrastructure service companies in South Asia, has appointed Sudhir Pai as the Director and Chief Financial Strategist for its India and overseas operations. Pai will be leading Valuepoint Systems’ endeavour to develop a sustainable financial model commensurate with its exponential global growth strategy. He will be based out of Bangalore. In his new role at Valuepoint Systems, Pai will leverage his business experience of 2.5 decades to consolidate and restructure Value Point group to derive optimum value to investors in the long term. 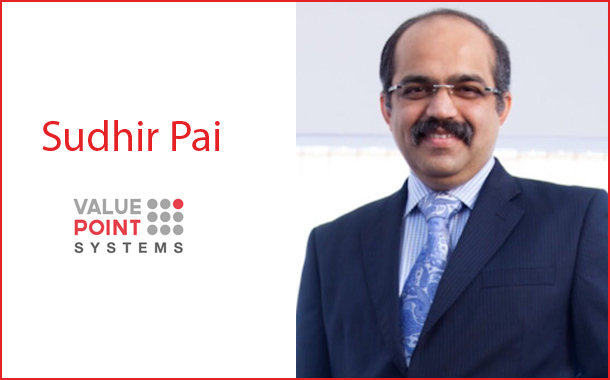 Sudhir Pai is a chartered accountant and brings with him over 25 years of healthcare and life sciences business experience. His experience spans around entrepreneurship with successful exits, managing Indian operations of large multinational companies based in USA and Europe, leading companies funded by private equity and venture capital investors. He sits on the board of several healthcare and IT companies. He has won laurels for his exceptional contribution to the companies he has worked with. Pai was recognised as a pioneer in biotech industry by UK trade & investment in 2012 for his contribution to clinical research industry. He was awarded entrepreneur of the year 2005 by one of the leading biotech magazines in the country for successful exit from a clinical research organisation which set valuation bench marks for the industry.